Events for 2015 / 2016. Core Aliveness Class - ONE ONLY for 2016! 7-9pm. 308 Montague Rd, West End. (Upstairs in the yoga space). I have been attending Trevor's Gay Men's yoga class on Thursday night for several years. One of the reasons I prefer this class is the constant surprise. With Trevor's training in four types of yoga plus Core Energetics, you never know what's going to happen next and I like that. He has an extraordinary ability to read the group as well as individuals and to adapt the class to suit our needs at the time. I find some positions are challenging but after the class I feel grounded, centred, calm and quite often euphoric. Nothing else I do gives the same mental, physical and spiritual rewards. I also enjoy the camaraderie of being in a group of gay men and the dinners after class are fun. QYoga Gay Men's Weekend Retreat - 17th, 18th & 19th May, 2013. Thank you everyone for a brilliant weekend retreat at Balin Garu! Brilliant food, superb accommodation, great work and great company. Thank you so much for helping to make it a real retreat - relaxing, rejuvenating and so enjoyable! It was a weekend of connecting with other men and our own embodiment in a safe, fun and accepting environment. A weekend that encompassed a balance of rejuvenating and relaxing activities including massage, meditation, yoga and social time wrapped around delicious, vibrantly healthy food. It was a great opportunity to have fun, laugh, ground, centre and connect with ourselves and other like-minded men, in a magnificent rural retreat setting. Balin Garu Gay Men's Retreat Accommodation (50km west of Grafton, NSW). Thank you so much! See you at the next one! (a few hundred metres from Moorooka Station). - New Series starts Monday, 13th April, 2015. Get grounded and shake off your week! Feel recharged, centred, connected, energetic AND relaxed. Join us to experience Brisbane's only Bioenergetics Grounding Class. "By creating a very supportive environment and involving everyone, Trevor allowed us to enter into this work almost effortlessly. He seemed to know where everyone was at and what they needed. This made the Bellbunya Retreat very effective, nurturing and very moving. It was an uplifting and motivating experience in a very special venue. For the first time I was able to connect with my body. I felt how amazing that was in allowing me to move on with my life. “And yeah, so I started doing some kind of, one on one sessions with him and pretty quickly saw some results . . from doing that work and then wanted to kind of continue doing that. It’s certainly a different process working with Trevor. I hadn’t had too much experience with any other kinds of psychology or other modalities of therapy um . . but there’s something about working with Trevor and the embodied nature, like the body psychotherapy element of it, that I felt it was far more beneficial than simply just talking about something. From the small experience that I had had with other kinds of therapy, I just found that that was far more beneficial for me. I could instantly see the effects, like the positive effects that that was having on my life. I think a lot of people would benefit from doing this kind of work. I would go so far as to say that everyone would but I also think that there has to be a willingness to want to do it as well. Whereas everyone could get benefit from it, I think you really have to want to have something in your life that you want to change or improve. Or something that you wanna grow through. I think feeling resistance towards this kind of work, is almost more of a reason to do it. I feel like we often resist things that we know would be good for us. And so if this work has kind of come to you and you’re in a position where it could possibly help, I feel like resistance is all the more reason to actually go for it and give it a go. Right from the get go working with Trevor he just, he holds this space and he just has this understanding energy that you feel like you can, I immediately I felt like I could talk to him about anything, express anything that I was feeling and there would be just total acceptance there. There was no judgement. As a facilitator for that, I couldn’t imagine anyone being better than Trevor. . . many things and yeh the embodied tools and techniques are what I find actually makes a difference to my life, instead of just learning more and then nothing changing. Everyone is different but who would benefit? I wouldn’t hesitate for a second to recommend Trevor to anyone. Everyone can potentially benefit as long as they are open and they feel it resonates with them. It’s appropriate for everyone. It’s a really safe and supportive environment; especially from Trevor, but also equally from all the other people involved in the work. If it’s group work in my experience. I have a great trust with Trevor in our relationship so we can sink straight into it really quickly, no muckin’ around. Which is good, really good”. Please complete this form to confirm your registration, or to make a registration enquiry. Payment Amounts are detailed on the Upcoming Events page. Please include your name in the details with your direct deposit. Please let us know when you have paid by completing the form on the right and we'll get straight back to you to confirm your registration. WHAT DO YOU MEAN BY 'GROUNDED'? Being grounded is another way of saying that you are IN YOUR BODY. There is 'more of you' here and now, because your mind isn't relentlessly worrying about the future or the past. You have your 'feet on the ground' and are fully present with your loved ones, work colleagues, family and friends. Being grounded allows a much clearer perception of reality as you are less defended, more stable, more open and better able to relate to the world as it is. WHAT IS BEING 'UNGROUNDED' LIKE? Ungroundedness means the loss of connection to your body, to be LOST IN THOUGHTS and disconnected from experiencing life 'in the moment'. Being “Ungrounded” can lead to increased levels of psychological distress, muscular tension, and dissociation with the body's wisdom and signals. It's very symptomatic of modern life, with a heavy focus on mental activity and ALWAYS BEING ON in a 24/7 world. We are excited to be bringing this work to Brisbane! We look forward to seeing you there! "The retreat was an incredibly powerful experience for me. It has been an essential step in my journey to come into a fully embodied, powerful, rich physical existence. I walked out in a grounded, strong, present state, I hadn't experienced that before, and the subsequent shifts that have unfolded in the week since the retreat have been deep and incredibly aligned to my soul path. the retreat. I experienced a strong, fluid, fun space in which anything and everything that I needed to let out was welcome. I was honoured to take part in the releases and experiences of the rest of the group, and I felt supported and respected by the group in my own personal process." "I respect and appreciate the energy that you bring to your work and to the retreat - I felt your whole Being there, with all of yourself, all your emotion, caring, strength, rawness, humanity, and deep belief in the work. I'm loving the new experience that Core Energetics is giving me - to have such an open space to physically express everything I feel is ground-breaking for me, and is opening the way for a new way of being where my authentic physical Being is honoured at all times as I move around my world. This is an inspiring vision for me, and one that seems rare as I look around the culture in which I live. Thank you again Trevor, for putting all your energy and care into creating such a transformational experience." 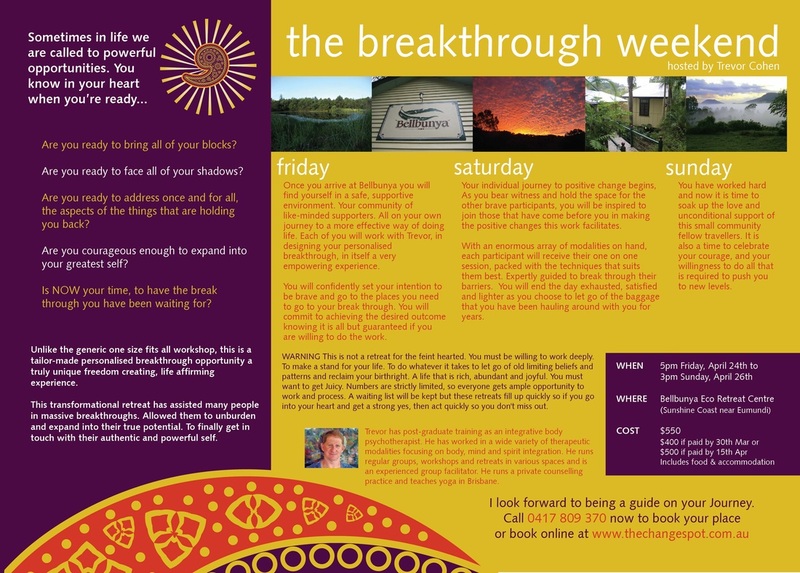 This fully-catered, residential and intensive workshop is being held in on the Anzac Day weekend in April, 2015. Participants engage in individual transformation in a safe and professionally-guided group setting. The weekend will provide a unique opportunity for deep inner-work and lasting transformation. At this retreat, you will work individually and in groups to understand, transform, and release the past as you deeply explore, experience, and express your blocked and held energy. You will work on your relationship to yourself and explore relating to others in radically alive ways. You will find what stands in the way of your full potential for life. The retreat is intended to provide permanent, radical change, not just offer a peak experience. Register below or call 0417 809 370 to book your place. (Places limited to 12 participants). Once you have registered, we will email you with confirmation and more details . Melbourne Workshop, YogaDance & Private Sessions. YogaDance Class (Saturday, 24th Jan. 7-8.30pm $30). Workshop - (Sunday, 25th Jan. 9am-4.30pm $150). Private Sessions - (Book a spot Monday - Wednesday 26th - 28th Jan. 1-on-1s $100 or couples $120). Call me for bookings or questions on 0417 809 370 - all prices are negotiable. ﻿You can register manually and pay via direct credit to our bank account, or by PayPal. At this retreat, you will work individually and as a group to understand, transform, and release the past as you deeply explore, experience, and express your blocked and held energy. You will work on your relationship to yourself and explore relating to others in radically alive ways. You will find what stands in the way of your full potential for life. The retreat is intended to provide permanent, radical change, not just offer a peak experience. Please use our Paypal Button on the right to register. Paypal allows you to pay from your Bank Account or Credit/Debit Card and gives you Paypal buyer protection. Alternatively, you can register manually and pay via direct credit to our bank account. Once you have registered, we will email you with more details of the location, where to meet, what to bring etc.